Well, I kept the contest post at the top for long enough now...anybody entering should have seen it by now. Today's feature is a corsair, alas, not mine but one that has influenced the construction of mine. Brickshelf user mikepsiaki has made this rather exellent lego fighter, it may not be space but it's still cool. The F4U Corsair I think is definatly one of the coolest looking fighters of the second world war, and this rendition pulled it off beautifully. Sadly there aren't any cockpit shots, and the canopy is rather fogged over. The idea is to create a spacified version of either the AVRO CF-105 Arrow, or the AVRO CF-100 Canuck. I'm looking for something that had used either as an inspiration - the influence must be visible, but a direct copy isn't what I'm looking for. The contest is open to anyone who may read this blog, members from bzp have been directed here specifically. One entry per person! Deadline is December 24! Judging should be done within the week after that. Enter by provding a link to the gallery with pictures in the comment section. I'll need a name, anything will do, and an email address. Prizes are: Bragging rights. Ships anywhere. Designs for a remake of the Fokker Kalen, and a portrait of the Red Baron, which looks strikingly like myself if I were to have such scars and uniform. My good friend, a veteran bzp .spacer and the one who invited me to CSF has made a spifftacular Federation fighter. The odd snot work on this gives a very edgy feel that somehow adds to the sleekness. Design features a neat forward sliding canopy that makes me green with envy, and a good number of guns. A good sized fighter, none of that miniscule crap. Well done. 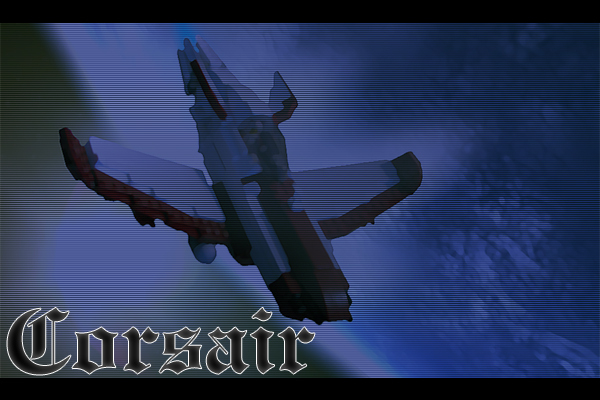 I said my corsair was upcoming, and although the weather hasn't allowed for good picture taking I made up a preview shot to give a taste. Click on the thumbnail to see the full pic, and enjoy. Well, I'm still organizing the contest, but I thought a little preview of what I plan to contribute would be just. Don't know if I'm entering or not, but I will make this none the less. As well, look for my SF-18 Corsair soon, she's looking sick. I'll keep that promise to stingray as well. Zepplin-class Strike Cruiser. See the bzp topic. As well, check around my B-shelf for new personelle pictures and some mirco-scale gun designs! Still nothing from me, bad lighting today. .Space contest on bzp is in the works, so check it out! Brickshelfer Peterlmorris has made a nice fighter, plenty of greebs and guns. It reminded me of the style the my friend, and fellow .spacer, uses - and the colour scheme is the same as well. It looks a little choppy in places, although that could be the point. Nicely done! Chris Giddens comes through with the LL-M1 Doulos Medical Ship. A massive ship, using a few unthoughtly pieces to achieve a nice smooth surface. Greebles are great as always, and the engines just make me purrr. Some part of me still wants to see a huge honking gun on this, but I like the medical take on it. Our curator of .Space on bzp recently retired from his services. This left me as the new curator. So the topic has been revamped and although I'm still working out some bugs, like the word filters, it's up and running. I now see the mass of code Spongey was talking about. Anyways, just a heads up. We had spongey for a year, hopefully I'll be around for a few more. heh. Can you say TAPE drive? CSF member Bigdaddy(Y-bros-K of bshelf) gave birth to this beautiful racer. I'm overly biast because it uses the same colour scheme that I do...but, albeit it's an awe inspiring model none-the-less. I think it would be better without that lame bumper on the bottom though, I can see where it's coming from. Just looks too damn eighties. My good friend(and ally) TT has done his first microscale cruiser, thus joining me as the only member to build cruisers for his faction. I like the look of bulk and brute on this model, a starking contrast to the almost elegent in comparsion Ventor frigate, although still connecting. Equipped for land-based shipping and invasions, at your convenience. I've been postponed on getting pics of my lastest stuff. So again I'll have to treat you to some more recent Brickshelf finds. B-shelf member Smartiac has constructed a Constructor ship, a rather large one. It comes complete with equally massive landing gear and a nice set of quad engines. There's a lack of interior shots, so I can't say anything about it...although the cockpit looks nice from the outside. B-shelf member jazzjake has a wicked first creation with his SNOT loaded fighter. It's an unusual colour scheme that he pulled off nicely, and a shape that screams studless. He's worked well with a small cockpit space, giving the pilot a healthy amount of controls. I deifinatly look forward to more from this guy. Click on the thumbnail to see the fullsize image. Daniel Jassim makes another gigantic ship, this one is space tanker. It works in modules and can go from a mere 50 studs long to 164! Engines on this one caught my eye. Alright, well nothing really caught my eye on brickshelf this time round. So I thought I'd have this entry with two of my favourite Microscale creations on Brickshelf. Both happen to be from Star Wars, but the construction of both is wicked and I thought I'd share. This creation by Roguebantha on brickshelf is a scale model of General Greivous' flagship, The Invisible Hand. The construction can be a little choppy in some spots, but when looked on as a whole, the model does greatly resemble the Providence-class cruiser from the Star Wars universe. The Venator-class StarDestroyer on scale to LEGO's ISD is by Brickshelfuser Netbus, also known by Primus and the owner of Brickcommander.com. Primus' ISD scaled cruisers have always been a favourite of mine, but this one seemed to be the best. The construction gives a very solid look to the model and I can't see any gaps in the plating. There's more pics of the creation scattered around his B-shelf, and even instructions. Thanks for visiting, look for a concept sketch coming from me soon, as well as a few more creations. Brickshelf user dennisc888 crafted a nice looking racer. Beautiful SNOT(Studs not on top) work and great colour scheme. That's all for today. I'll be gone from tomorrow until sometime sunday, I'll try and update on sunday or if not, monday. This will be a blog about space lego. Some of it will be by me, others by others that I find wickedly intriguing. I will actually specify which, lol, when posting.